Yorkshire terriers are exceptionally amazing due to various reasons. You will never face disappointment for bringing this dog to your home, rather you will be gratified to make one of the best decision of choosing this dog as a pet. To make you certain about this fact we have listed out ten points that will support your decision of bringing this dog into your home. Most of us, face resistance from our family members while deciding to buy a dog as a pet. Normally, this resistance is due to the fact that dogs require space that could be difficult to provide due to constricted space or small apartment. You should not be afraid of facing this controversy in the case of Yorkshire as they are of too small in size thus requiring very limited space. Even if you have a small living place, there would be plenty of room available for this little fellow. Yorkies are one of the most mobile breeds of dogs. Due to their tiny size, they are quite portable and easy to be carried everywhere. So, either you are leaving for vacation, going to relatives or just hanging out with friends, accompanying Yorkie with you will never be annoying. You can just place your puppy in a medium sized handbag and none will even notice its presence. Yorkie can happily adjust in a small flat. But you must also know that it’s not just the size that makes them acceptable. Yorkies are by nature very adaptive and accommodative. They will adapt to a new place and environment very quickly as compared to other breeds of dogs. Yorkies are immensely playful and very energetic. They are always enthusiastic to play different games. You will be amazed to see that when Yorkies are in a mood to play, they move their tail swiftly to express the desire to play games and enjoy. This is a unique expression of this dog to ask for playful attention. 5. Yorkshire Terrier has a really special coat! Yorkies tend to have unique coats whose color changes with age. An adult Yorkie usually has a light colored coat whereas baby Yorkie has a darker coat. They have long hair that can be groomed into chic styles. As Yorkies do have hair instead of fur so they do not shed fur fibers. They possess hair like humans so don’t worry at all if you have carpets in your home and you are afraid of having a dog whose fur could tangle in carpets and destroy them. 7. Yorkies are the most devoted dogs! Yorkies have great feelings of love, affection, and friendliness. They will be quickly obliged to your love and attention. Yorkie will always positively respond to your care and feelings. 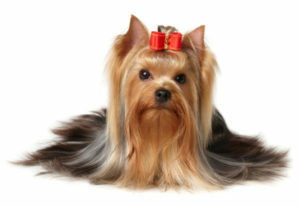 According to some researches, it is proven that a Yorkshire terrier dog has a longer life than any other breed of dogs. It is stated that Yorkie can live for more than 15 years that is very rare among the breeds of dogs, so you are going to have your dog with you for a long time. Usually, people think that Yorkies are difficult to train. This is just a misconception, Yorkies are super active and highly intelligent dogs who learn very quickly, so Yorkies are not going to disappoint you in training sessions. Yorkies are suitable for people with allergies due to the fact that Yorkies are hypo allergic. Yorkies are immensely cute and adorable creatures that you would love for entire life. You can do anything with them, you can dress them, and give different hairstyles to them even accessorize their hair with embellished items. They are just lovely dolls with whom you can play and talk as well.